With the Batman prequel series Gotham preparing for its final season on Fox, fans are ready to say goodbye to their favorite characters. One of the show's biggest breakout performers has been Robin Lord Taylor, who has played Oswald "Penguin" Cobblepot since the very beginning of the series. A unique take on the supervillain, this Penguin has physically very little in common with other depictions of the character, despite having the same trademark waddle. According to Taylor, however, the final episode of the show will feature a decade-long time jump, and when we last see Penguin, he'll likely look more like he does in the comic book pages. "We've done everything else with this character it has its own unique twists and it's also everything is earned and everything makes sense this character is turning into the traditional Penguin that we all know and so we see it visually as well as emotionally." Taylor says he "gets chunky" for the show's final episode, confirming he'll be wearing a fat suit for the finale. This is more in line with how we typically view the Penguin, as he's usually depicted as an older, heavyset man. While Taylor doesn't provide any more details, we can take a few guesses as to which other elements of the comic book Penguin will be adapted. It's likely we'll see the monocle or the top hat, if not both, and this seems to be an interesting way to bridge the gap between the Gotham Penguin and the one comic readers recognize. Of course, every other character will be going through some changes after the finale's time jump as well. Perhaps Jim Gordon will have finally grown out some facial hair, and maybe he'll be wearing his trademark eyeglasses. What has been confirmed officially, though, is that we will definitely be seeing Batman by the end of the show, as the series finale has been promised to actually show the audience the Caped Crusader in his Batsuit. Although season 4 of the show ended in a cliffhanger, there had been uncertainy over whether Fox would renew the series for season 5. Fortunately, the series was given the order for a fifth and final season by the network, giving its writers the chance to lie up all of the loose ends. 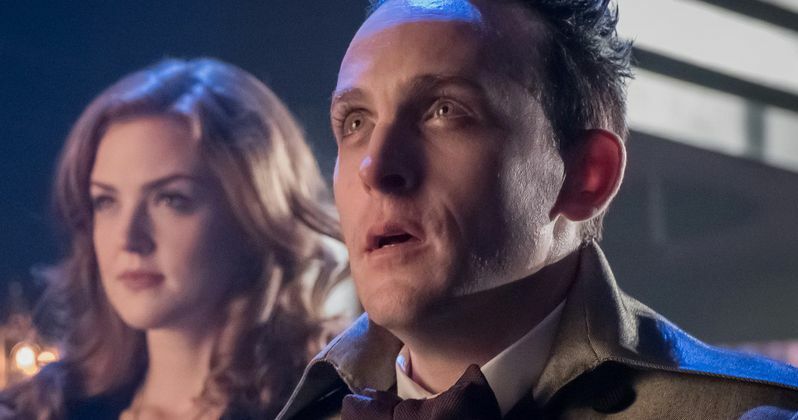 Because there were plans to keep the show going for longer, Gotham will now have to rush to conclude each of its storylines by the end of the show, making the lengthy time jump necessary. Gotham might be coming to an end, but its producers are already moving on to another unique prequel story inspired by Batman characters. The show Pennyworth will detail the life of Alfred in the years before he becomes the butler at Wayne Manor. It will be unconnected to Gotham, taking place in another universe, meaning Sean Pertwee will not be reprising the role. This information comes to us from ComicBook.com.